Back in 1999 I was a subscriber to a short-lived magazine called "Battlefields Review". One particular issue included an item about the Old Comrades Association of the Machine Gun Corps [MGC] and a proposal to write a history of the Corps. A request was made for information and photographs to assist the project. 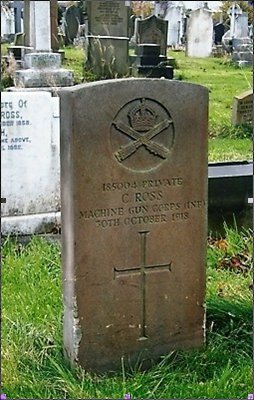 I was researching the army service of my wife's grandfather at the time: James Cooper served with the Motor Machine Gun Service [MMGS] from 1915-1918. I made a note of the request and put it on one side meaning to get in touch and offer the project the photographs that the family had of Jim and his unit. Naturally I forgot all about the request! When I was searching through my papers to prepare the talk I delivered about Jim Cooper at January Branch Meeting, I came across my note. Expecting to be told that I had "missed the boat", I emailed the given contact point in June 2008. I discovered that the history project was still progressing "although quite far from finishing", and that Jim's photographs would be welcome! My contact was able to provide me with additional information on the MMGS, and more specifically, Jim's unit. He also told me about a group of people in the MGC Old Comrades Association who had set out to visit and photograph every MGC headstone and memorial in the world. MGC personnel are buried in more than 30 countries around the world, the vast majority naturally being in France and Belgium. Over 16,000 MGC officers and men died during the Great War. About 9,500 are buried or commemorated in France, 3,500 in Belgium, 200 in Germany, 1,200 in the UK and more than 20 in Eire. Of the remainder, the largest concentrations are in Egypt, Greece, India, Iraq, Israel and Italy. Small numbers are located in 23 other countries. By June 2008, the total number of MGC graves visited across the world had reached over 9,300 - more than half the total. In France and Belgium the total is almost 100%, in Greece 87%, Italy 75% and the UK 70%. As a token of appreciation for the information I had been given, I offered to take some photos for the project. My first thought had been to see if there were any on the "most wanted" list in the areas to be visited on our Branch Field Trip. Learning that the graves remaining to be photographed in France were off the usual Western Front circuit, I looked at the UK areas still requiring visits. One of our daughters and both of our grandchildren live near Chester and I discovered that there were some graves yet to be photographed in Cheshire. From the list the Photographic Project Team supplied, I identified five graves that were within reach of our usual route to and from Chester, and I undertook to photograph these. The Photographic Project Team were able to give me grave plot references at the four civilian cemeteries involved, and I wrote to the cemetery authorities to obtain the whereabouts of the plots within each site. One grave was located at St. Wilfrid's Parish Church in Davenham. They not only provided me with very precise directions to the grave, but also offered to take the photograph for me! This left me with four graves to find in three cemeteries. So it was in November that my wife and I were driving up the Wirral Peninsula in pouring rain to Wallasey and Rake Lane Cemetery. We arrived at the cemetery and the rain stopped. I found the two graves that I was seeking quite easily and took photographs. Both headstones appeared to be of CWGC design, but seemed to be cut from sandstone. We next travelled to Flaybrick Cemetery at Birkenhead, and found our way down very narrow tracks to the area where the grave I sought was supposed to be located. The area was much overgrown. Although a couple of CWGC headstones were visible, neither marked the grave I was seeking. Then I noticed within the plot a memorial wall bearing the names of several Great War casualties including my man. After I had photographed the memorial we pressed on to the final cemetery on our itinerary. Bebington Cemetery is very well ordered, but here again I was unable to locate an individual headstone. As I found at Flaybrick, the name I sought appeared on a memorial with other Great War casualties. With my last photograph taken, we started our journey home. The manager of the Photo Project Team has since told me that there are many instances in the north of England and in the Birmingham area, where casualties are buried in what amounts to a communal grave, with their name recorded on a nearby "screen wall" or memorial. He did not know why this should be so, but suggested that space restrictions may have had something to do with it. He indicated that my experience at Birkenhead and Bebington came as no real surprise - "a photograph of the memorial with the name thereon is the best we can achieve." At the time of writing there are still a number of graves to be photographed in England - but none south of Leicestershire so I am told.